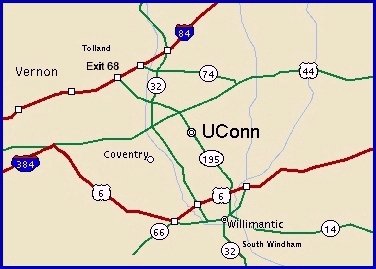 Directions to the Hawley Armory dojo of the University of Connecticut JKA. Proceed until you reach the University. Go past the north entrance (there will be a big white church on your right at the corner). Proceed about 300 yds and take your 1st right into the south entrance (just past the pond on your right). The road will bear to the right around the pond, then straight for about 200 yrds. Just before you reach a little dead end traffic circle, there is a parking lot on the right. 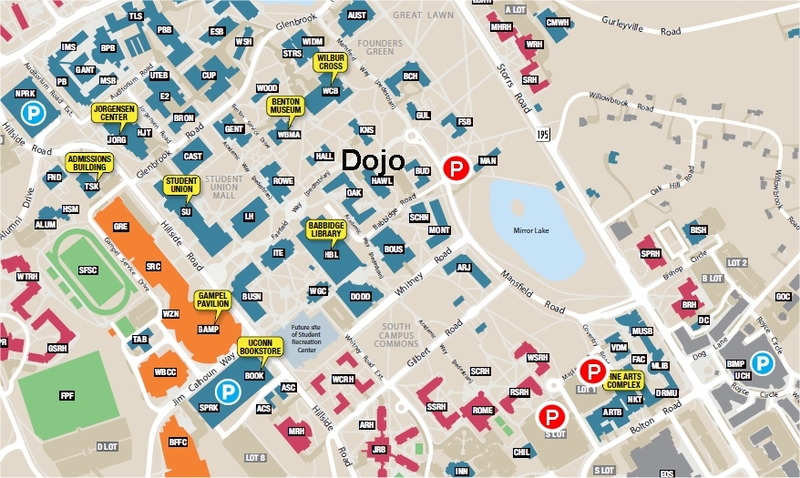 This is the closest to the dojo (see map below - dojo is marked "HAWL"). Hawley Armory is an old red brick building with tan double doors and two "towers". If the closest lot is full, there is another free lot (marked "P" in red, see map) down the road. Campus pay parking garages are marked "P" in blue. Otherwise, if you arrive on a weekend or after 4:30 pm you can park most places on campus except on the grass or a yellow curb.